So, check us out here. Get to know us. 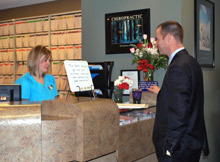 Then, contact our Overland Park chiropractic office to make an appointment so we can get to know you. We try to create a warm and inviting atmosphere in our office. You will be greeted on arrival by a caring staff that is there to assist in making your initial visit as easy and comfortable as possible. If you have not already completed your initial paperwork you will complete it to inform the doctor about the condition you are seeking help with. You will then meet the doctor to discuss your health goals and see if chiropractic is likely to help you. If the doctor feels it will be of benefit, an examination will be performed to identify the cause of your problem. After the doctor has reviewed your history and examination he will give you a Report of Findings. This is where he will explain what he found and his recommendations for treatment. This two visit approach helps the doctor have a chance to review all of your information and correlate a treatment plan to help to meet your unique heath care needs. After your first two visits, the time spent in the office is much shorter. Although the time spent with the doctor is shorter, he will evaluate your progress and make the specific corrections that need to be made and get you on your way. Each visit builds upon the one before, so it is very important to keep your scheduled appointments so that we can make the necessary changes. We know your time is valuable and we will do all we can to stay on time and to minimize the impact on your busy life. We also realize that emergencies do occur. Our patients know we will take the time to help them when these important situations occur.